Jazz and Rye from Big Apple. Widow Jane is a Spirit-lovin’ booze-makin’ Brooklynite. The distillery carries the name of a nearby Rosendale mine that’s the source of crystal-clean agua that comprises the DNA of every Jane’s Spirit – and back in the day, the limestone that came out of that place built the Empire State Building and the Brooklyn Bridge. And the water isn’t the only thing sourced locally – all the grains come from the nearby farms. Eco-friendly booze, baby! The products that come out of Widow Jane are winning awards left and right, so they must be doing something right. Rye is a sweet thing when it comes fresh from the still and it’s the barrel that brings the wonderful spiciness. Widow Jane has a trick where new oak and applewood staves are placed inside barrels that used to hold 10YO Bourbon. The result of this wonderful combo is nothing short of a symphonic apple medley. A Big Apple Spirit that’s bold and flavorful with apple notes (obvs) and cool late-night smoke-filled tobacco vibe. It just yearns for some jazz tunes, this one. 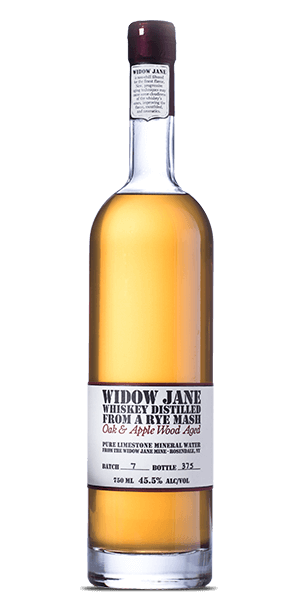 What does Widow Jane Distilled From a Rye Mash - Oak & Apple Wood Aged Whiskey taste like? The Flavor Spiral™ shows the most common flavors that you'll taste in Widow Jane Distilled From a Rye Mash - Oak & Apple Wood Aged Whiskey and gives you a chance to have a taste of it before actually tasting it. Apple cider and a hint of tobacco on the nose. Bittersweet and smoky flavors mixed with hints of licorish anise. Sweet and crisp apple-flavored finish. Solid 8. Better after it gets some air. Growing up surrounded by apple trees in upstate New York I was impressed how well the apple wood complimented this rye. The minerals from the mine give it an extra smoothness and sweetness that just makes it all the better. A Distillery (or Two) Grows in Brooklyn - Which to Visit? Revealing the Stars of Flaviar Spirits Community Awards for 2015! Rye vs. Bourbon: What's the Difference? Love Bourbon? You Should Really Try Rye!